Character-building five-cylinder power continues to be the lifeblood of the Audi TT RS, which can be ordered in the UK from late September in all-new, 400PS form priced from £51,800 OTR. 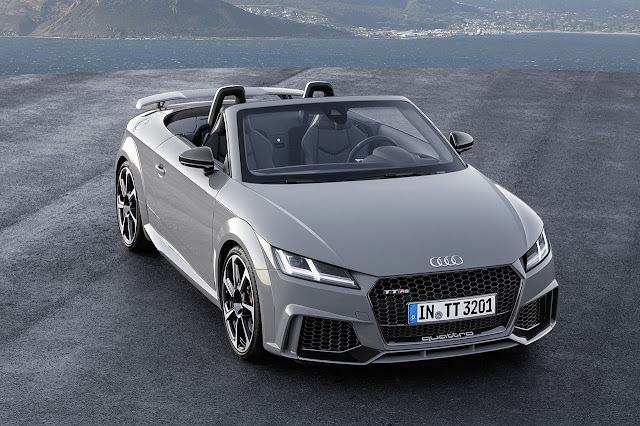 Available as before in Coupé and Roadster form, the most powerful series production TT to date merits comparison with the supercar elite with its sub-four-second acceleration capability and potential 174mph top speed, and offers a similarly exclusive specification that fittingly also brings the option of new Audi Matrix OLED lighting technology on stream for the first time. 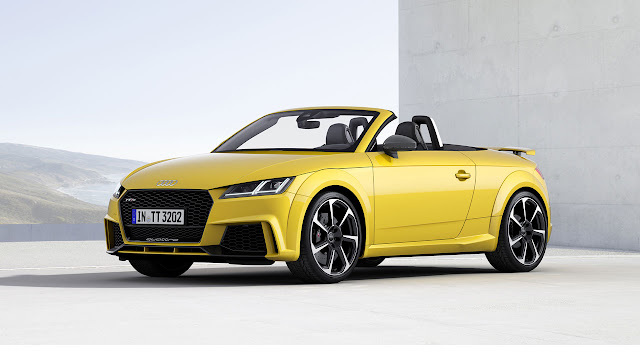 Lighter than its predecessor by 26kg, thanks in large part to the integration of an aluminium crankcase, the newly developed five-cylinder, 2.5-litre TFSI engine with dual injection and Audi Valvelift technology brings to bear a 17 per cent increase in performance in the latest TT RS. The considerable uplift in power and torque - from 340PS in the outgoing ‘standard’ car to 400PS and from 450Nm to 480Nm - facilitates a searing 0-62mph sprint time of 3.7 seconds (Roadster 3.9 seconds) on the way to a governed top speed of 155mph. This peak can be raised to 174mph if the optional Dynamic Package Plus is specified. The cost-effective package also includes a sports exhaust system which helps to further distil the very essence of this car, namely its addictively offbeat five-cylinder engine note. In the interest of performance the weight of the seven-speed S tronic transmission which deftly manages the engine’s formidable output has also been reduced by around 2kg thanks to a new angle drive to the prop shaft. Its shift characteristics can be tailored to the driver’s requirements via the Audi Drive Select adaptive dynamics system, which offers Comfort, Auto, Dynamic and Individual modes. These also have a bearing on the operating parameters of the RS-specific progressive steering, the throttle, the exhaust flaps and the quattro all-wheel drive system. In the TT RS quattro takes the form of a multi-plate clutch-based system capable of freely distributing power between the axles for incisive, high-grip handling. It works with wheel-selective torque control which also favours agility, and with an elaborate suspension configuration that firmly affixes the car to the road without compromising its innate adjustability. The body of the TT RS sits ten millimetres lower than the entry level TT, and this also applies when the Dynamic Package incorporating RS sport suspension plus with Audi magnetic ride is specified. Employing special dampersfilled with synthetic oil in which magnetic particles that can be influenced by a magnetic field are suspended, Audi magnetic ride is able to adapt the damper’s operating characteristic to the profile of the road and style of the driver at millisecond intervals. It is another feature that can be modulated using the onboard Audi Drive Select system. The lowered body ensures that the standard 19-inch cast wheels with their five-arm polygon design fill their arches even more amply. They are available in either silver, matt titanium look or gloss anthracite black finishes, as are the 20-inch 7-spoke rotor design alternatives which are exclusively available on the TT RS as an option. Within the impactful wheels are fittingly forceful brakes, the front internally ventilated, perforated steel discs with eight-piston calipers measuring 370 millimetres in diameter and the monobloc discs at the rear 310mm. Stainless steel pins join the friction ring to the aluminium brake disc chambers to dissipate the heat quickly. Carbon ceramic front discs which are particularly abrasion-resistant and light are available as an option for especially committed drivers. The intense concentration of power that all these features help to harness warrants a raft of special exterior applications which clearly define the TT RS as the front-runner in the TT line-up, and also help the car to cleanly pierce the air with an impressive 0.32 or 0.33 cd value depending on version. Standout features include the large air inlets, a Singleframe grille with a newly designed honeycomb lattice and quattro logo, aerodynamically-shaped side sills and of course a fixed rear wing sitting on two thin double struts. Owners keen to play down the performance potential at their disposal can swap this for the automatically extending spoiler familiar from the ‘mainstream’ TT models if required. Beneath this is a striking bumper with a strongly profiled diffuser insert with four vertical fins flanked by the large bore elliptical tailpipes of the RS exhaust system. The stocky body can be specified in a choice of nine ‘standard’ colours, including the RS-specific tones Nardo grey and Catalunya red, metallic. In addition to this, numerous customised paint finishes are available through the Audi exclusive programme. All can be combined with optional matt aluminium and gloss black styling packages which soften or darken the look of the Singleframe grille surround, RS rear spoiler blade and diffuser insert. Inside, the super sports seats upholstered in Fine Nappa leather and the TT RS sport leather and Alcantara steering wheel with its new integral ‘satellite’ buttons for engine start/stop and Audi Drive Select functions are the first to grab attention. From the comfort of the driving seat the fully digital Audi virtual cockpit with its 12.3-inch high definition also quickly makes its presence felt – it provides a choice of three views, including a special RS screen that highlights the rev counter and provides additional performance data plus a shift light which informs the driver when the rev limit has been reached. Upon request, the RS screen can also display individual tyre pressures. The virtual cockpit displays mapping from the MMI navigation plus system which is standard for UK TT RS models in full ‘wide screen’ format. It also serves as the interface for the Audi Connect online services which are included as standard on a three-year subscription basis and can be extended at the end of the term. 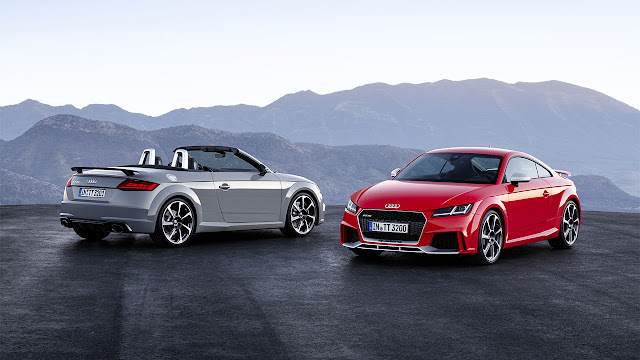 Highlights of Audi Connect include Google Earth mapping and Google Street View, online weather updates, travel information and news, access to Twitter and integration of a Wi-Fi hotspot for in-car web browsing on personal devices. Key technology options include the Audi phone box, which enables compatible mobile phones to be charged inductively and paired with the onboard antennae for optimal reception, and the new Audi smartphone interface displaying selected apps from a user’s handset directly in the Audi virtual cockpit. The Bang & Olufsen sound system is another highlight for fans of excellent acoustics. 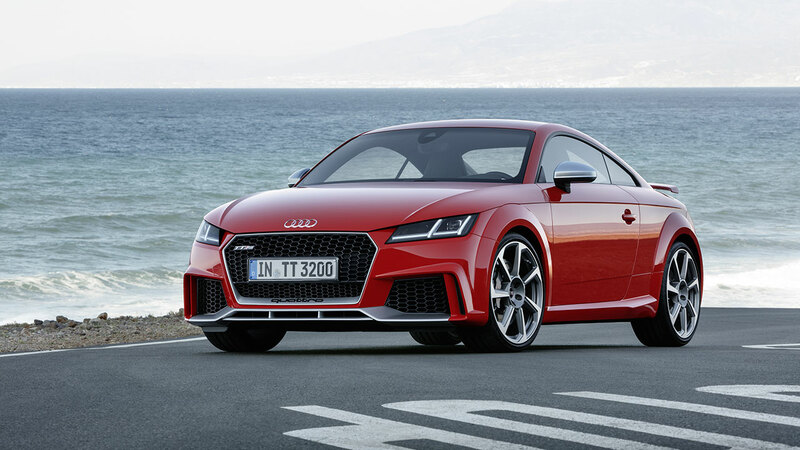 Another milestone technological development is also available to enhance the exterior of the TT RS. It can be specified with Matrix Organic Light Emitting Diode (OLED) rear lights which make their Audi series production debut here. These advanced new lamps in 3D design comprise four wafer-thin units, the largest of which bears the TT logo and the four Audi rings. They emit an extremely homogeneous, high-contrast light which can be continuously dimmed, does not cast any shadows and does not require any reflectors, making them both efficient and visually impressive. The new Matrix OLED units are available as an alternative to the ‘standard’ LED rear lamps with their dynamic rear indicators, and in a similar vein the standard LED headlights can also be replaced on request by Matrix LED lamps containing 12 separate controllable LEDs which form the high beam and can be individually shut off when sensors detect traffic ahead or approaching, to ‘divert’ their beam around other road users.